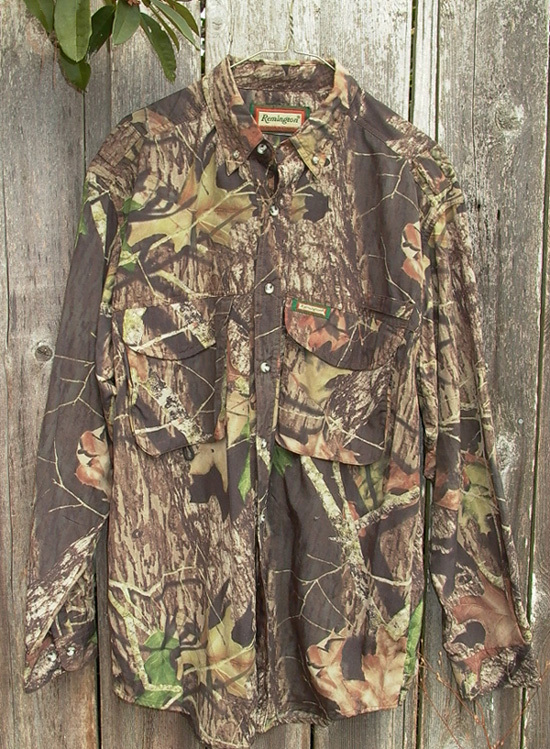 The Brinkman Corporation makes these lightweight hunting shirts for Remington as "official licensed product." The Rem-Lite long sleeve shirt (#17142) that is the subject of this review is available in Mossy Oak Break-up, Realtree Hardwoods Green, and Advantage Timber camo patterns. I especially appreciated the ability to open the mesh back vent for extra ventilation by simply undoing the single hook-n-loop tab that holds it closed. There is even a little patch of hook-n-loop sewn to the underside of the shirt back to which you can stick the hook-n-loop tab so that it doesn't inadvertently close the vent. The front pockets are of the spacious "cargo" type, and the collar points button down to keep them from blowing around. There are several nice little touches like that incorporated into these shirts. Clearly someone familiar with what works in the field designed this shirt. The Rem-Lite shirts proved to be a good choice for my hot weather hunt. Ventilated mesh back and armpits with hook-n-loop closure for maximum comfort and breathability. Button roll tabs on sleeves. Available in Mossy Oak Break-up, Realtree Hardwoods Green, and Advantage Timber. The quality and construction of these shirts is good. The basic fabric is very lightweight (probably some kind of durable polyester), breathable, machine washable, and all of the seams are double stitched. My shirts are in the Advantage Timber and Mossy Oak Break-Up patterns. The shirt's front closure is by means of camo (no kidding) buttons. The Rem-Lite line also includes the #17141short sleeve shirt, #17143 6-pocket shorts, and #17144 6-pocket pants. I have seen the Rem-Lite long sleeve shirts priced as high as $50, but I bought four of these shirts during an end of season closeout sale at a Bi-Mart discount department store for $15 each. I regard it as money well spent.